Ok, so let’s get my embarrassing little secret out of the way, the kids have turned me into a closet Alanis Morissette fan. And hacking away at my desk this morning, I find myself humming the lyrics. 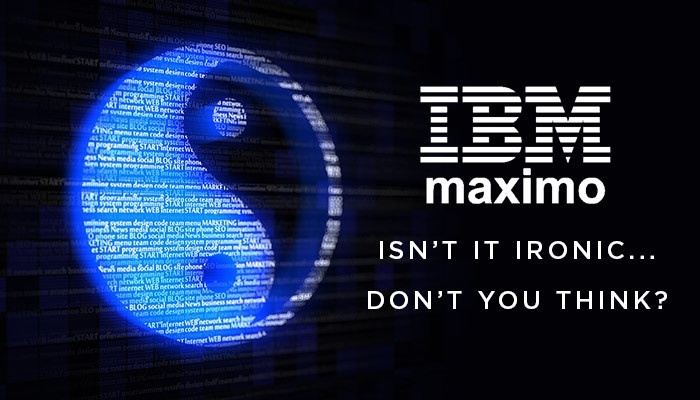 Because sometimes my Maximo user experience is just that, ironic! On the one hand you have arguably the world’s most potent Asset Management System capable of so much, but on the other hand, there are still a few small things missing – the black flies – that turn the experience from pleasurable to downright irritating. At the risk of turning this blog into an outright rant, the one that gets me the most is the inability to add attachments to BIRT Reports (Work Orders / Purchase Orders). With Maximo out of the box, I’m being forced to export my reports as PDF documents, and then manually add my attachments to an email, finding the correct recipient and sending. Now I know that this is not an issue that threatens global stability, but the frequency does make it extremely repetitive, time consuming and irritating. Asset Managers should not be spending their time wrestling with process and planning issues instead of doing the work they were hired to do. Creating operational excellence, and driving process efficiency is a critical part of the remit. At Certus this is a challenge that we have embraced, and have created the Certus Assets Insights Platform. The Certus Asset Insights Platform is a solution that modernises a client’s asset information management capability. It helps remove silos, barriers, and system interoperability issues to deliver a single view of your assets. The solution is designed to integrate all the critical facets of modern asset management, in a modular and scalable way. Baked into the Platform are five unique solutions that Certus has developed to help improve the user experience and drive operational excellence. The first of these, Certus Dynamic Attachments, provides an elegant solution to this problem. Now with a click of a button on the application toolbar, you can effortlessly add dynamic attachments and use an email template specifically tailored for your business and the documents being sent. The process can also be automated as part of a workflow, so when an Asset Manager approves something it triggers an email and includes the results of a report as a PDF attachment, thus tying it automatically into an existing process. If you want to know more about Certus Dynamic Attachments, then you can download the solution sheet here. Or if you would like to read a bit more about our Asset insights Platform then you can download the eBook here. And, just for fun, if you have your own Maximo ‘black fly’ annoyances, then I’d love to hear about them in the comments below. Lastly, if you noticed that I combined two of the verses, then you are way more of a closet Alanis fan than me!